Shirts With Random Triangles: Alabama hires Greg Byrne to succeed Bill Battle as athletic director. Alabama hires Greg Byrne to succeed Bill Battle as athletic director. Greg Byrne. Image via azcentral.com. Nick Saban has a new boss. 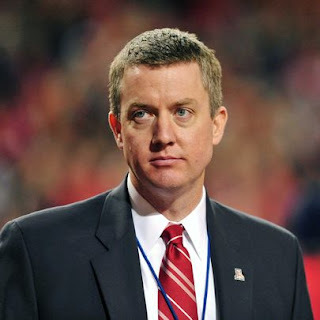 The University of Alabama has announced that Greg Byrne will take over the office of athletic director beginning on March1. Byrne, currently AD of Arizona, will be succeeding Bill Battle, who has been 'Bama AD since 2013. Battle announced he would be stepping down from his position Sunday evening, and become a "special assistant" to University of Alabama president Stewart R. Bell. Byrne became the AD for Arizona in 2010. He was previously AD at Mississippi State from 2008-2010. Arizona has named its senior associate AD Erika Hanson Barnes to serve as interim AD while a search for a successor to Byrne can begin.